What’s the difference between a news article and an opinion piece/editorial? How can I cite data from this project? Please view the Museum’s citation page. [author name], “[article title],” [newspaper name], [date], [edition], [section], http://newspapers.ushmm.org/xxxx (accessed [date]). [author name]. “[article title].” [newspaper name], [date], [edition], [section]. http://newspapers.ushmm.org/xxxx (accessed [date]). United States Holocaust Memorial Museum, History Unfolded: US Newspapers and the Holocaust, http://newspapers.ushmm.org, accessed on [date]. United States Holocaust Memorial Museum. History Unfolded: US Newspapers and the Holocaust. http://newspapers.ushmm.org. Accessed on [date]. Who is reviewing my research? Can I get credit for this? Will I be acknowledged in any way? Yes. When you set up a user account to perform research, it will track all research that you have submit to the project. Your username will be credited beside data displayed on the site. If you have any complaints or objections to Content posted on the Museum’s website because it was not properly credited or it was posted without permission, please contact the Museum’s Office of General Counsel at ogc@ushmm.org with your contact information and the link to the relevant Content. Why did you pick these events? The research you add to History Unfolded is helping the Museum and scholars to better understand American knowledge of, and responses to, Nazi persecution of Jews during the Holocaust. Originally, this research was used to support development of a special exhibition, Americans and the Holocaust. The curator of that exhibition identified several topics for investigation, and events were chosen based on his research priorities. Many were events that reflected socio-economic and political pressures that influenced American responses to the Holocaust, such as the threat of war, isolationism, antisemitism, and racism. 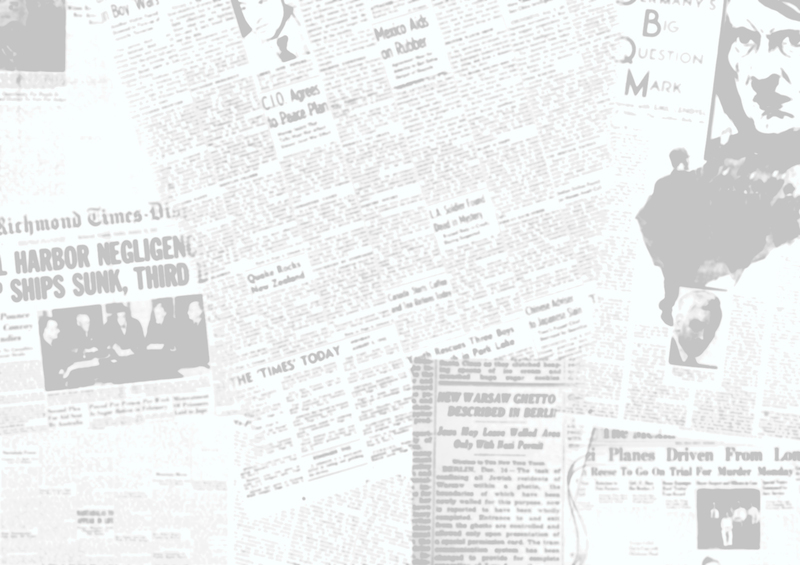 Now that the exhibition has been completed, your continued participation can help the Museum to compile as close as possible to a comprehensive collection of data about American newspaper reporting on the Holocaust during the 1930s and 1940s. Our hope is that this data will enable scholars to better understand the nature and scope of US press responses to the Holocaust. Can I suggest a new event? Yes. We plan to add new events for research during the life of this project. Please send your event suggestions to the Community Manager. What if I notice a mistake? If you notice any errors in data published on this site, please notify the Community Manager immediately. Be sure to include a link to the entry and to identify the newspaper, date, and headline of the article in question. Can I contact the article contributor with a question? No. For privacy reasons, we do not allow you to directly contact project researchers. However, questions or requests may be routed through the Community Manager. When submitted, all data is reviewed by the project’s Community Manager for accuracy. The Community Manager will compare the entered data against the image that was uploaded, and if everything is accurate, the data will appear in the online database, viewable by the public. You will receive a notification from the Community Manager when your research is validated. How can I use the data on this site? Anyone can access data compiled in this project by selecting the Search Database function. You can search by keyword and filter data by event, location, newspaper name, headline, article type, author, and date.